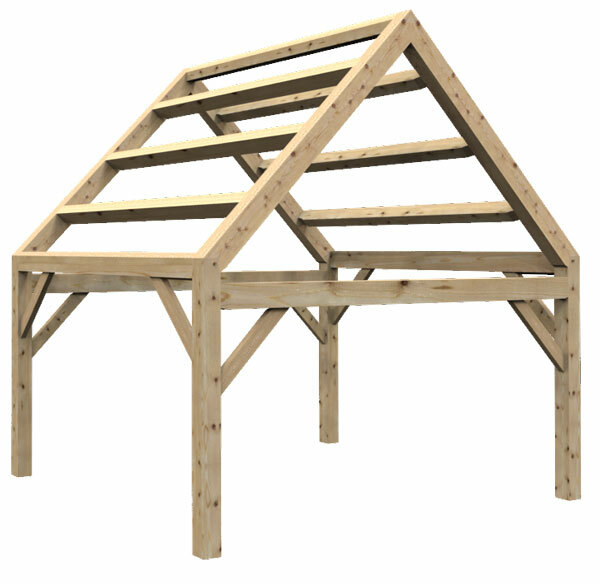 Raising a timber frame is without a doubt the most dramatic aspect of the craft. Within hours, a stack of assembled timbers is transformed into a free-standing structure. Our typical raising involves cranes or heavy equipment and many who observe the process remark about the excitement and express a desire to participate. Unfortunately the size, scope and safety concerns during a typical raising are too large to allow for voluntary participants. It is unfortunate because community raisings are fine American tradition that we would love to foster and participate in more of. Well low and behold we have a project in the works that is a perfect fit for a hand raising and we hope you will take the opportunity to join us. 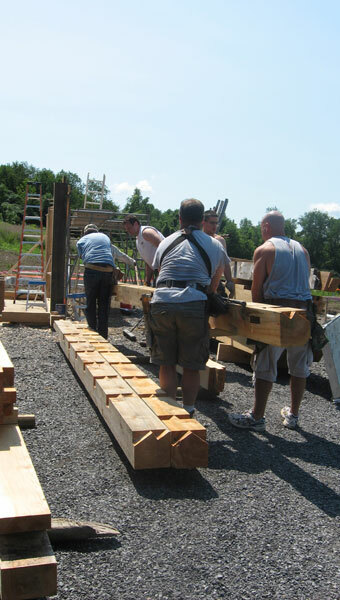 Whether you a true timber frame lover or just interested in learning more about the craft we cordially invite you to join us in this fun project. The What, How, and When? We now have a date fro the hand raising; Saturday June 23rd. The event will start at 9 but if you like you can arrive a half hour earlier. 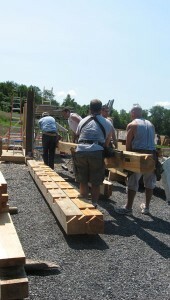 Following a basic safety and lifting plan discuss we will begin to lift the first bent shortly after. We would like to get the rasing off to a good start so please try to arrive early so you don’t miss all the fun. Most importantly bring your posistive attitude but if you have personal protective equipmnet; hard hat, safety glass, etc. feel free to bring them along. Safety is our prime concern and we will provide use of needed equipment(mostly hard hats) during the day. Please Note: The hand raising will quite literally be a hands on event and participants should expect to do some lifting and get some sawdust on them. If you would rather observe than participate please indicate that when contacting us so we can effectively plan the raising. We hope this will be a rewarding experience for all involved and look forward to seeing you there. If you have a specific project in mind, especially for this coming building season today is the time to get in touch with us.